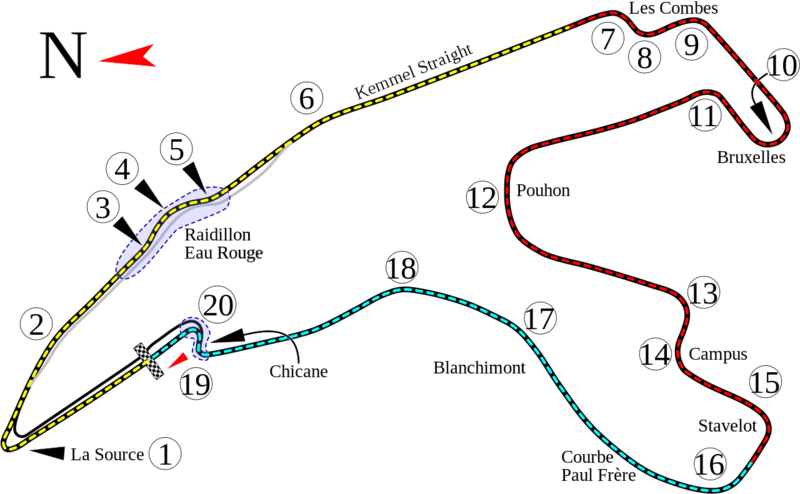 After the straightforward yet unexpected win in Valencia, the next round of my little career was Spa, Belgium – one of Formula 1’s most famous circuits. As with Valencia, practice and qualifying took place under a combination of wet and dry conditions, but this time I was fast in both – though not without an unexpected issue in practice, that gave me concerns about the race. So far, the game handles engine problems as an all or nothing scenario. It either works or it doesn’t. This time around, it did something different. As I ran my practice laps, the engine (which normally displays as a white box) became orange, which with things like tyres, signifies heavy wear. Sure enough, my lap times dropped off by around two seconds; I was pushing hard on the straights, was I stressing the engine? Qualifying went well and I nailed pole, but I had that lingering doubt in my mind about the car. Would it hold together? When the race started I was able to once again remain in the lead on the first lap, bullying another car (one of the Red Bulls I think) into turn 1. The race was a wet one, but in practice I’d been easily faster, even in wet conditions, and thus pushed on, not concerned about the chasing pack. I’d soon have reason to be worried though, when my engine switched to yellow, marking a drop in power. I would still edge away from the chasing cars behind me, but not nearly as quickly as I had before. All of a sudden, things were touch and go. It would get worse. On lap 19, three laps before my second stop, my rear right tyre developed a puncture. I had little choice but to pit early, and whilst I would regain the lead by taking advantage of traffic, the intermediate tyres were not good at handling even a regular set of laps, let alone extra laps, and my pace as I approached the final stop wasn’t great. Even though it all, I was able to maintain the lead, seeing off the chasing cars behind, securing my first win in damp conditions! More importantly, Button was only 9th, meaning I closed the gap to just 2 points in the title race! All of a sudden, the title is back on!